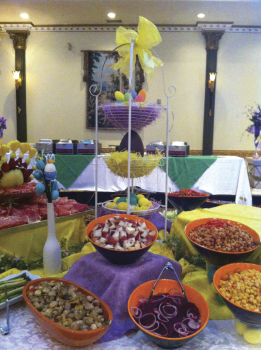 Julius Banquet Centre rings in spring with their annual Easter buffet. As I visit the banquet the day before Easter I can see that owner Cesare and his team are hard at work preparing the building for celebrations and a fine feast. Cesare started his business in Bolton in 1992, under the name of Cesare’s Convention Centre and came to the corner of Finch and Arrow Road eight years later. There are three events that Cesare hosts annually for 300-400 guests: Easter Sunday brunch, Mother’s Day brunch and Christmas Eve dinner. For Easter brunch Cesare prepares a buffet that consists of the traditional lamb, along with ham, sausage, cold cuts, breads, cheeses, salmon and 20 different types of salads. He prepares the French-cut lamb pieces the day before, by marinating it with rosemary, extra virgin olive oil, garlic, oregano and white wine. Then on Easter Sunday, after all the juices have soaked in, he roasts the lamb to perfection. Cesare’s personal favorite is the pasta station, where guests can make their own pasta. First they choose their preferred style of pasta: gnocchi, penne, spaghettoni, or tortellini. Next they select their sauce, from their choices of bolognese, tomato sauce, vodka or panna (a white sauce). Lastly the guest has the opportunity to garnish the pasta with a few different types of cheeses or chili flakes. No meal is complete without dessert. Keeping this in mind Cesare skillfully constructs a table of deserts that is both a feast for the eyes and mouth. In addition to some simple cheesecakes there are more complex desserts such as cream puffs made from puff pasty dough and other assorted pastries. The dessert that stands out the most is Cesare’s version of tiramisu. The traditional Italian desert usually consists of lady fingers dipped in coffee, layered with mascarpone custard and whipped cream, shaped in the form of a piece of rectangular cake. Cesare changes this desert as he takes the basic ideas of the dessert and reinvents it. He layers his ingredients into a dessert glass, tops it off with whipped cream and graded chocolate bits. 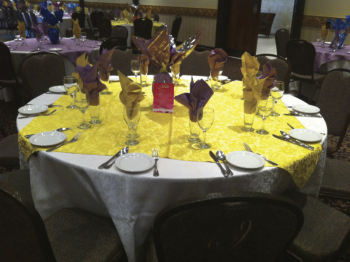 The Banquet Centre is a museum that is host to Cesare’s creativity, echoed through the presentation of the food. Cesare began his culinary journey as a hospital cook. At first he was at St. Joseph’s and then he cooked for staff and patients at St. Michael’s hospital. Between the hours at the hospital he also catered on the weekends, slowly building a name for himself through his food. 20 years later he opened the Banquet hall, combining his culinary and customer service skills. Ceasre keeps in mind the importance of reputation in an industry that is loaded with competition, maintaining service and quality as the building blocks of his business. The Banquet Centre offers packages for many types of events including weddings, bachelor/bachelorette parties, baby showers and much more. For more information check out the website: http://www.juliusbanquetcentre.com/ or call for an appointment at (416) 746 9500.